Many people today believe that the only double deck airliner to enter service is the Airbus A-380, but in doing so they neglect the Breguet “Deux Ponts” which pioneered the double deck concept more than 60 years ago. The Breguet 763 was developed as a land plane derivative of the Br.730 flying boat. Its development began in 1944, shortly after the Liberation of France. The Br.761 prototype was first flown in 1949 and it quickly became obvious that its Gnome-Rhone engines were underpowered so the design was altered to produce the 761S with Pratt & Whitney R2800 engines. A tall centre fin was added. The 3 Br.761S pre-production aircraft served with Air Algerie, Sliver City Airways and later on the Armee de l'Air. Air France became interested in the design and requested some alterations. More powerful versions of the R2800 were installed, which required larger propellers which in turn required a 60 cm increase in the wingspan at each wing root. The centre fin was given a shorter, more rounded outline. 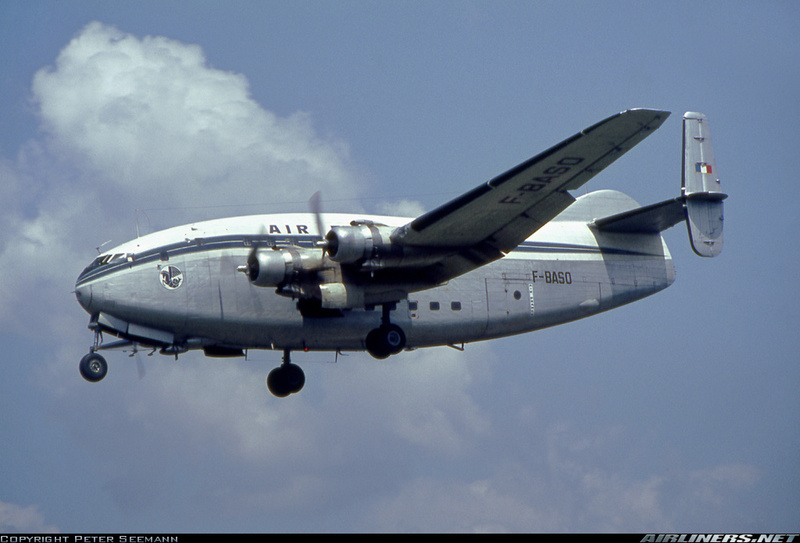 12 Br.763s flew for Air France from 1953 until 1971. This is definitely a short-run model. There is flash, the edges are rough and the sprue gates are much larger than those of a mainstream model. But it's all good, because no mainstream producer would be likely to do a Br.763 (the only other kit of this aircraft is the Welsh Models vac kit). Treat this kit like a vacuform that's already been cut out but not yet completely sanded down. The panel lines are scribed and fairly delicate. They'll look good under a coat of paint. The plastic is slightly rough and it will benefit from a good polishing since the paint scheme involves natural metal. The edges of the mouldings are quite rough and will definitely need sanding down to ensure they match evenly. The instructions are one 8 1/2 X 11 page with a one step exploded diagram and full colour painting guide and a complete history of the Br.763 in French on one side and English on the other. The painting guide and assembly instructions have notes indicating variations that the builder should consider. Study the assembly diagram carefully; the kit includes parts for the 761S and 765 military transports as well as the 763 airliner so the builder needs to be aware of which parts not to use given that only a few of the smaller parts are numbered. These are called out in the assembly diagram. The fuselage is two halves from nose to tail. The only interior piece is a roof/rear bulkhead for the nose wheel well. There are no windows. If you want them open, you'll have to drill them out yourself. The plastic is fairly thick so the edges of the windows should be thinned. The instructions call for 3/4 oz of nose weight (I don't know why they didn't use grams; it would be 21g). The wings are two pieces each, with inserts for the main wheel wells. The ejector pin marks inside the wing halves look like towers. They will have to be sawn or chiseled out and the rough edges ground down before the wings will be able to be assembled. The control surfaces are moulded with both wing halves. They could benefit with thinning down. The tailplanes are upper and lower halves which have a small locating tab. The modeller may wish to drill and pin them just to make sure. The outboard fins are one piece each for upper and lower fins. The central fin is two halves which fit onto the fairing on the fuselage. Each engine is a one piece cowling with an engine face insert and two pieces meant to represent the exhaust stacks which fit into each side of the cowling. These are a bit crude and some modellers may wish to replace them with sections of micro tube. The propellers are one piece and should look good after being cleaned up. The landing gear struts and wheels are basic. Each main wheel is made up of two halves. They will need cleaning up before they can be assembled. The nose wheel strut suffers from mould slippage and will be oval after it's cleaned up. It would be difficult but not impossible to fabricate a replacement. The main struts are chunky but do not have the same problem. As with all 1/144 kits, the gear doors are overly thick and may be replaced if the modeller wishes. I don't compare models to drawings or published measurements. When assembled it looks like a Provence. The decal sheets are nicely printed. There is a large laser printed sheet with a selection of registration letters, door outlines and a set of deicing boots. The main colour scheme is printed as a regular silk screened decal and includes the cheatlines, windows and two variations of Air France titles. My review sounds fairly harsh, but when built with the usual amount of “some modelling skills required” this kit will yield a convincing Br.763. Remember that this is a French short run kit, done by a cottage industry company. Treat it accordingly and it will give you a good model. Verdict: Try this one as your second limited run kit. Hi Jessica, Well done with your airliner blitz! I appreciate your participation and bringing these under-represented subjects to life. Do you have Minicraft's Hercules to review by any chance? No, I haven't got the Minicraft Herk. For some reason they're pretty scarce here on the Left Coast. There isn't one kicking around the Aeroscale sample room that I could do a build review on, per chance? Here are some reviews I found during a quick trawl of the depths of the interwebs. The consensus seems to be "Nice kit, needs a few cockpit details". LINK LINK LINK LINK LINK Bra.Z offers resin engines and a conversion fuselage and cargo floor for the lengthened -30 version. LINK Welsh Models does some nice vac and resin Herks, but they're a trifle expen$ive. Probably because Minicraft beat them to it, Amodel has one out and Revell already has a 1/144(ish) Herk in the catelogue from many years gone by. The bean counters wouldn't let them waste the money on a kit that's already been done. That's why they'll be working on yet another Messerspitstang. Jose, surely you jest? What was so important about the Provence? One thing, looks like the pre-war ugliness carried over to the post-war..